Anyone who is familiar with adventure games knows the general formula behind one; there’s an adventure to be had in a strange world and you’re going to save the day by beating up monsters and bad guys. It’s the way it has been for years. Game developers have tried to deviate from this formula, putting their own spins on the idea, but it ultimately comes out the same; they may make an awesome game or a bad one, but in the end, it’s pretty much the same thing just with better graphics or a bigger environment. It’s not easy coming up with something unique when you’ve had generations before you trying to do the same, but it’s not impossible. The creators of the game Undertale have shown me this. The creators of Undertale took the lump of clay that was the standard of adventure games and crafted it into something beautiful. It was created by Toby Fox with help from other creative minds. It is an adventure, role-playing game where the player controls a girl who has fallen into the Underground, a place below earth where monsters were sealed away by humans years ago (warning to those who hate spoilers, there are many ahead). I’d like to go through a few categories of what makes the game special. This game can be seen, at its base, as a parody of older adventure games (it is possible that influence for it was drawn from the Earthbound series), as it pokes fun at standards found within those games as well as keeping a unique quirky sense of humor about it that keeps you on your toes, expecting something wacky around the corner. For example, signposts are usually put in games to direct a character to specific places. In Undertale, there is a signpost located in a snowy area of the game. Reading it reveals directions: “North ice, south ice, west ice, east Snowdin Town… and ice”. The game has tons of jokes and funny descriptions like this, with each one being as unexpected as the last. This fits well into the game’s environment because it is shown that most monsters are not vicious, but are just as much children as the child you are controlling. It’s also interesting to note that a great deal of this humor is found through optional conversations and interactions; basically, the game is as funny as you choose to make it. Undertale has a pretty wide variety of characters that all have very lovable and sometimes complex personalities. Not only do their quirks and actions make you love them, but make you love those that they care about in the game, even if you haven’t met them yet. Their words aren’t written to set them in a stereotypical role nor are they always written to set them in a positive or negative light. Like in real life, your thoughts on a stranger are ambiguous and you’re cautious around them, ready for what could be a drastic change. For example, a character named Toriel acts as the mother figure to the child as she found them at the start of the game. She is very kind to the player though is also annoying and overprotective in ways (much like a mother can be). You’ll find yourself uncertain because the game doesn’t go out of its way to convince you to commit one side so you are left to wonder whether who you are seeing is who the character truly is or if it’s a trick like in Hansel and Gretel. And what’s better, you’ll probably hope she is as she seems, just as you’ll hope that the other characters are truly how they seem. Although I wouldn’t recommend the game for children, I think parents will find it surprising that you don’t have to kill anyone to win. That’s right, you can read that previous line again. Undertale is one of the few games I’ve ever heard of where you can win it all without harming anyone yet with the option to kill always being available. This doesn’t mean you can just walk through the game casually, as you will have to find ways to defuse conflicts between yourself and your opponents and doing this is just as hard, if not harder, then going on a killing spree. And referring back to the comedy of the game, defusing the situation often means making friends with the monsters in strange ways. My favorite right now is Lesser Dog; every time you pet him, his neck will grow a little longer, to the point where continuing to pet him will make his neck go above the game window, only to bend off screen and continue stretching downward. I’ve talked a lot about the comedy of the game, but not about the darkness that comes with it. The game’s plot holds a balance between good and evil, funny and horrifying, life and death, where two opposites can switch within seconds of each other and this is often times due to the path you’ve chosen. Some conflicts will seem impossible to solve, tempting you to take the easy way out through violence. You can actually kill every character in the game if you wanted to, but the game will not remain oblivious to your actions; the consequences of your actions will be shown in the child’s dark personality, in the comedy that I referred to before all, but drying up, and in the desperate attempts by main characters to stop you, through pleading, bargaining, and force. The game goes so far to break the fourth wall to refer to the person playing the game, pointing out the perverse nature of their choices, as well as some other choice words referring to gamers that take such paths. To have the ability to reset everything has always been one of the key elements that made playing games be an escape from reality. 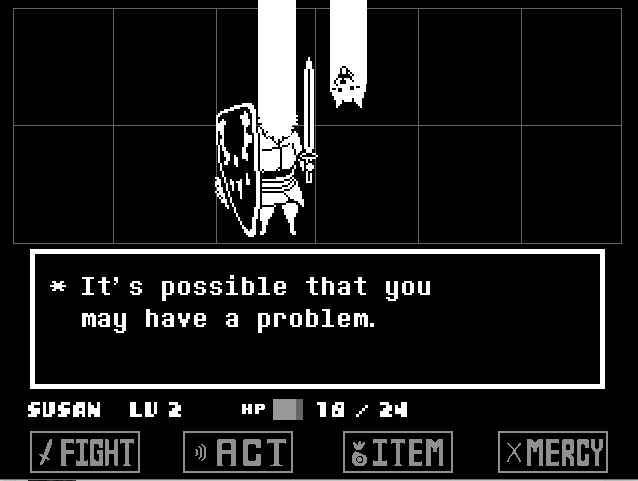 Undertale, on the other hand, takes a piece of this power away, to where you can still reset it, but the game remembers what you did. IN game text will change with characters, conveying a feeling of déjà vu. Also, the game sometimes remembers things you did even if you didn’t save it, which brings with the game a feeling of unease and mystery when such things occur. There are much worse examples than this and what’s more, the creators made it so you can’t easily hack into the game’s code to undo this stuff (even deleting the proper files that are saving this information is useless because they just reappear somehow). I could go for pages about the unique graphics, secrets hidden inside the game’s code, the original soundtrack, the dodging aspect of the battle system, and so much more, but I think I made my point. My final thought on the game is this; I think of Undertale as not only a parody, but also redemption to people who enjoys these types of games. Up until now, the games they played in the past said that to save the day, they needed to kill to progress, destroy “evil” monsters, and, in doing so, become a hero. They might even force you to kill someone you liked in the game. There was no choice in the matter, but in Undertale, you have the opportunity to be on the side of life. You can spare all you want or kill all you want. The choice is the player’s and from now on, they can’t say that they were never offered a choice in the matter. I really encourage you to check out the game for yourself.